Happy Bloggers Challenge Friday! Thanks to those who played along with last weeks Farm Fresh Challenge! This weeks Challenge theme is Flower Power. 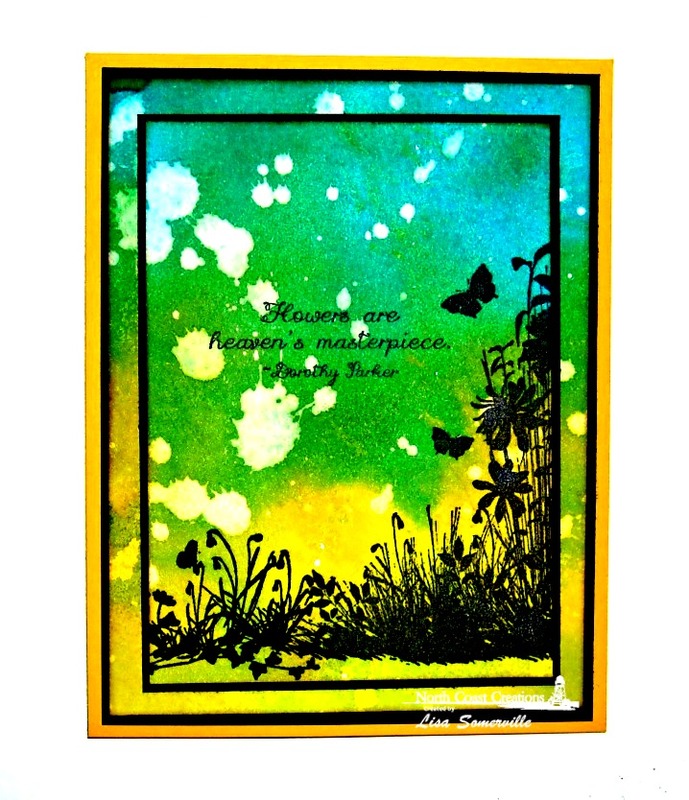 To create the background for my card, I used Dylusions Sprays and the Gelli Arts Plate. Once the background was dry, I stamped the silhouette flowers from North Coast Creations Heaven's Masterpiece and Find Beauty stamps sets in Black Archival, then used a SAMJ to add the quote. I added splotches to BG by dropping water droplets onto the BG and blotting them to remove bits of color. If you'd like to play along with this weeks Bloggers Challenge, please link back to this post on your blog and mention you created your card for the Bloggers Challenge Flower Power Challenge. Please add your link using the Link Tool below, your link should be a direct link to your Bloggers Challenge Post, use your name as the Title. Please do not link to cards that were created prior to the challenge date. Entries not linking properly, or backlinked will be removed. If you have the captcha enabled on your blog, please consider turning it off, as it makes it so much easier to leave comments. This is beautiful, Lisa! I love the contrasting black mats behind the bright panels. I finally bought a black archival ink pad and it stamps so much darker than any I've had (it does stink like crazy though). Love the background with the gelli plate, you do such awesome work with that! love your card... great technique!!! 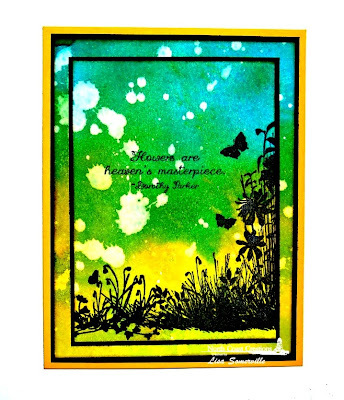 Totally fabulous background - Dylusions on a Gelli plate... what a cool idea.